Battery recycling is a recycling activity that aims to reduce the number of batteries being disposed as municipal solid waste. Batteries contain a number of heavy metals and toxic chemicals and disposing of them by the same process as regular trash has raised concerns over soil contamination and water pollution. Most types of batteries can be recycled. However, some batteries are recycled more readily than others, such as lead–acid automotive batteries (nearly 90% are recycled) and button cells (because of the value and toxicity of their chemicals). Rechargeable nickel–cadmium (Ni-Cd), nickel metal hydride (Ni-MH), lithium-ion (Li-ion) and nickel–zinc (Ni-Zn), can also be recycled. There is currently no cost-neutral recycling option available for disposable alkaline batteries, though consumer disposal guidelines vary by region. These batteries include but are not limited to: car batteries, golf cart batteries, UPS batteries, industrial fork-lift batteries, motorcycle batteries, and commercial batteries. These can be regular lead–acid, sealed lead–acid, gel type, or absorbent glass mat batteries. These are recycled by grinding them, neutralizing the acid, and separating the polymers from the lead. The recovered materials are used in a variety of applications, including new batteries. Recycling the lead from batteries. The lead in a lead–acid battery can be recycled. Elemental lead is toxic and should therefore be kept out of the waste stream. Lead–acid batteries collected by an auto parts retailer for recycling. Many cities offer battery recycling services for lead–acid batteries. In some jurisdictions, including U.S. states and Canadian provinces, a refundable deposit is paid on batteries. This encourages recycling of old batteries instead of abandonment or disposal with household waste. In the United States, about 99% of lead from used batteries is reclaimed. Businesses that sell new car batteries may also collect used batteries (or be required to do so by law) for recycling. Some businesses accept old batteries on a "walk-in" basis, as opposed to in exchange for a new battery. Most battery shops and recycling centres pay for scrap batteries. This can be a lucrative business, enticing especially to risk-takers because of the wild fluctuations in the value of scrap lead that can occur overnight. When lead prices go up, scrap batteries become targets for thieves. Used most frequently in watches, toys, and some medical devices, silver oxide batteries contain a small amount of mercury. Most jurisdictions regulate their handling and disposal to reduce the discharge of mercury into the environment. Silver oxide batteries can be recycled to recover the mercury. Lithium-ion batteries and lithium iron phosphate (LiFePO4) batteries often contain among other useful metals high-grade copper and aluminium in addition to – depending on the active material – transition metals cobalt and nickel as well as rare earths. To prevent a future shortage of cobalt, nickel, and lithium and to enable a sustainable life cycle of these technologies, recycling processes for lithium batteries are needed. These processes have to regain not only cobalt, nickel, copper, and aluminium from spent battery cells, but also a significant share of lithium. In order to achieve this goal, several unit operations are combined into complex process chains, especially considering the task to recover high rates of valuable materials with regard to involved safety issues. Specific dangers associated with lithium-ion battery recycling processes are: electrical dangers, chemical dangers, burning reactions, and their potential interactions. A complicating factor is the water sensitivity: lithium hexafluorophosphate, a possible electrolyte material, will react with water to form hydrofluoric acid; cells are often immersed in a solvent to prevent this. Once removed, the jelly rolls are separated and the materials removed by ultrasonic agitation, leaving the electrodes ready for melting down and recycling. Pouch cells are particularly easier to recycle in this way and some people already do this to salvage the copper despite the safety issues. As of 2017[update], the recycling of Li-Ion batteries generally does not extract lithium since lithium-ion battery technology continuously changes and processes to recycle these batteries can thus be outdated in a couple of years. Another reason why it isn't being done on a large scale is because the extraction of lithium from old batteries is 5x more expensive than mined lithium. However, it is already being done on a small scale (by some companies and efforts are being made to commercialize an industry in expectation of large quantities of disused batteries to come. Italics designates button cell types. All figures are percentages; due to rounding they may not add up to exactly 100. Several sizes of button and coin cell. They are all recyclable in the UK and Ireland. * Figures for Q1 and Q2 2012. A battery recycling station at a bus stop in Madrid. In 2006, the EU passed the Battery Directive, one of the aims of which is a higher rate of battery recycling. The EU directive states that at least 25% of all the EU’s used batteries must be collected by 2012, and rising to no less than 45% by 2016, of which at least 50% must be recycled. In early 2009, Guernsey took the initiative by setting up the Longue Hougue recycling facility, which, among other functions, offers a drop-off point for used batteries so they can be recycled off-island. The resulting publicity meant that a lot of people complied with the request to dispose of batteries responsibly. From April 2005 to March 2008, the UK non-governmental body WRAP conducted trials of battery recycling methods around the UK. The methods tested were: Kerbside, retail drop-off, community drop-off, postal, and hospital and fire station trials. The kerbside trials collected the most battery mass, and were the most well-received and understood by the public. The community drop-off containers which were spread around local community areas were also relatively successful in terms of mass of batteries collected. The lowest performing were the hospital and fire service trials (although these served their purpose very well for specialized battery types like hearing aid and smoke alarm batteries). Retail drop off trials were the second most effective (by volume) method but one of the least well received and used by the public. Both the kerbside and postal trials received the highest awareness and community support. Household batteries can be recycled in United Kingdom at council recycling sites as well as at some shops and shopping centres—e.g., Dixons, Currys, The Link and PC World. A scheme started in 2008 by a large retail company allowed household batteries to be posted free of charge in envelopes available at their shops. This scheme was cancelled at the request of the Royal Mail because of hazardous industrial battery waste being sent as well as household batteries. An EU directive on batteries that came into force in 2009 means producers must pay for the collection, treatment, and recycling of batteries. This has yet to be ratified into UK law however, so there is currently no real incentive for producers to provide the necessary services. 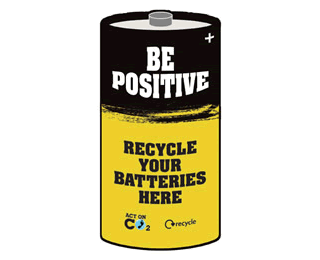 From 1 February 2010, batteries can be recycled anywhere the Be Positive sign appears. Shops and online retailers that sell more than 32 kilograms of batteries a year must offer facilities to recycle batteries. This is equivalent to one pack of four AA batteries a day. Shops which sell this amount must by law provide recycling facilities as of 1 February 2010. In Great Britain an increasing number of shops (Argos, Homebase, B&Q, Tesco, and Sainsbury's) are providing battery return boxes and cylinders for their customers. The rechargeable battery industry has formed the Rechargeable Battery Recycling Corporation (RBRC), which operates a battery recycling program called Call2Recycle throughout the United States and Canada. RBRC provides businesses with prepaid shipping containers for rechargeable batteries of all types while consumers can drop off batteries at numerous participating collection centers. It claims that no component of any recycled battery eventually reaches a landfill. Other programs, such as the Big Green Box program, offer a recycling option for all chemistries, including primary batteries such as alkaline and primary lithium. A study estimated battery recycling rates in Canada based on RBRC data. In 2002, it wrote, the collection rate was 3.2%. This implies that 3.2% of rechargeable batteries were recycled, and the rest were thrown in the trash. By 2005, it concluded, the collection rate had risen to 5.6%. In 2009, Kelleher Environmental updated the study. The update estimates the following. "Collection rate values for the 5 [and] 15 year hoarding assumptions respectively are: 8% to 9% for NiCd batteries; 7% to 8% for NiMH batteries; and 45% to 72% for lithium ion and lithium polymer batteries combined. Collection rates through the [RBRC] program for all end of life small sealed lead acid (SLA) consumer batteries were estimated at 10% for 5 year and 15 year hoarding assumptions. [...] It should also be stressed that these figures do not take collection of secondary consumer batteries through other sources into account, and actual collection rates are likely higher than these values." A November 2011 New York Times article reported that batteries collected in the United States are increasingly being transported to Mexico for recycling as a result of a widening gap between the strictness of environmental and labor regulations between the two countries. In 2015, Energizer announced availability of disposable AAA and AA alkaline batteries made with 3.8% to 4% (by weight) of recycled batteries, branded as EcoAdvanced. Japan does not have a single national battery recycling law, so the advice given is to follow local and regional statutes and codes in disposing batteries. The Battery Association of Japan (BAJ) recommends that alkaline, zinc-carbon, and lithium primary batteries can be disposed of as normal household waste. The BAJ's stance on button cell and secondary batteries is toward recycling and increasing national standardisation of procedures for dealing with these types of batteries. In April 2004, the Japan Portable Rechargeable Battery Recycling Center (JBRC) was created to handle and promote battery recycling throughout Japan. They provide battery recycling containers to shops and other collection points. ^ Bernardes, A. M.; Espinosa, D. C. R.; Tenorio, J. A. S. (3 May 2004). "Recycling of batteries: a review of current processes and technologies". Journal of Power Sources. 130 (1–2): 291–298. doi:10.1016/j.jpowsour.2003.12.026. ISSN 0378-7753. ^ "Battery Care, Use, and Disposal". Duracell. 2016. Retrieved 26 July 2018. Our alkaline batteries are composed primarily of common metals — steel, zinc, and manganese — and do not pose a health or environmental risk during normal use or disposal. We have voluntarily eliminated all of the added mercury from our alkaline batteries since the early 1990s .... Therefore, alkaline batteries can be safely disposed of with normal household waste, everywhere [in the U.S.] but California. ^ "Battery Council" (PDF). Battery Council. ^ a b c Hanisch, Christian; Diekmann, Jan; Stieger, Alexander; Haselrieder, Wolfgang; Kwade, Arno (2015). "27". In Yan, Jinyue; Cabeza, Luisa F.; Sioshansi, Ramteen (eds.). Handbook of Clean Energy Systems - Recycling of Lithium-Ion Batteries (5 Energy Storage ed.). John Wiley & Sons, Ltd. pp. 2865–2888. doi:10.1002/9781118991978.hces221. ISBN 9781118991978. ^ a b Hanisch, Christian. "Recycling of Lithium-Ion Batteries" (PDF). Presentation on Recycling of Lithium-Ion Batteries. Lion Engineering GmbH. Retrieved 22 July 2015. ^ "Derfor er det vanskelig å resirkulere elbilbatterier". Teknisk Ukeblad. 1 December 2016. Retrieved 25 February 2017. ^ "Litiumet i batterierna går förlorat". Ny Teknik. 13 February 2017. Retrieved 25 February 2017. ^ "Ny metode kan gjøre gjenvinning av litium fra elbilbatterier lønnsom". Teknisk Ukeblad. 23 February 2017. Retrieved 25 February 2017. ^ a b "EU agrees battery recycling law". BBC Online. 3 May 2006. Retrieved 22 October 2010. ^ Numbers actually for years "before 2008" and "now", (that is, 2017), from http://yle.fi/uutiset/3-6434741 (in Finnish). The change is related to large grocery stores being obligated to accept used batteries from consumers. ^ Date, Will (19 September 2012). "UK 'on course' to meet first battery collection target". letsrecycle.com. ^ Guardian Newspaper Online, Leo Hickman 13-12-2007. Battery Recycling and Ethical Living. Retrieved 9 September 2008. ^ http://www2.sainsburys.co.uk/YourIdeas/forums/10060/ShowThread.aspx Sainsbury's help centre. ^ Department for Environment, Food, and Rural affairs, 18 December 2009 Archived 12 April 2010 at the Wayback Machine. Defra, UK - Environmental Protection - Recycling and waste. ^ Directgov, 22 January 2010 Archived 15 October 2012 at the UK Government Web Archive. Recycling batteries: Directgov - Environment and greener living. ^ Info on store takeback. Press article from 'Register Hardware 27-10-2006. Retrieved 9 September 2008. ^ Info on recycling. WRAP - UK based Waste and Resources Action Programme. Retrieved 15 June 2011. ^ RIS International Ltd. (February 2007). Canadian Consumer Battery Baseline Study: Final Report (PDF) (Report). Environment Canada. "Table 4.11: Recycling Rate Estimates for Secondary Batteries", on page 27 (PDF page 40). Retrieved 15 March 2012. ^ "Battery Recycling in Canada 2009 Update: Executive Summary: 4. Battery Recycling". Environment Canada. 2009. Retrieved 15 March 2012. ^ reports, Tribune wire. "Energizer debuts recycled AA and AAA batteries". chicagotribune.com. Retrieved 23 April 2018. ^ "Energizer EcoAdvanced Recycled Batteries". www.energizer.com. Retrieved 23 April 2018. G. Pistoia, J.-P. Wiaux and S.P. Wolsky, ed. (2001). Used battery collection and recycling. Industrial Chemistry Library, Volume 10. Amsterdam: Elsevier Science. ISBN 978-0-444-50562-0. This page was last edited on 24 March 2019, at 16:32 (UTC).